“Leave one wolf alive and the sheep are never safe.” So states a disguised Arya Stark (Maisie Williams) in the season seven premiere of Game of Thrones. The sentiment rings true for most of the standing characters on the HBO drama. After six seasons of bloodshed and betrayals, the survivors of each of the respective families are standing up as wolves and fighting for what they believe should be theirs. This new season is the show’s penultimate one and this means that the battle for the Iron Thrones is only intensifying. The premiere sets the stage for the remaining battles to come. Arya begins the season seeking revenge against the Freys’ betrayal but throughout the kingdom, others are looking for blood as well. With the aid of her adviser Tyrion Lannister (Peter Dinklage), Daenerys Targaryen (Emilia Clarke) plans to retake the throne her late father once commanded. 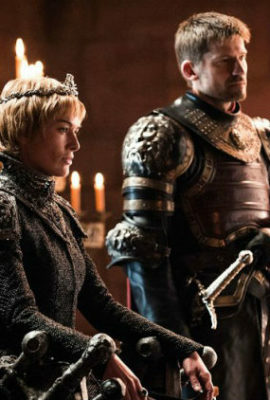 Cersei Lannister (Lena Headey), the reigning Queen, wants to eliminate all of the traitors surrounding King’s Landing (and she believes there are traitors everywhere). In the North, where Jon Snow (Kit Harington) reigns, he hopes to eliminate the threat of the White Walkers. The final showdowns are quickly approaching. Show creators David Benioff and D.B. Weiss seem to be relishing these stories and continue to astound with their storytelling capabilities. The pace of the show can be a little slow at times but what we’ve learned over the past six seasons is that the program knows how to set the stage well for climactic sequences. In the episode’s closing moments, for instance, the camera slowly follows Daenerys and her mostly silent entourage as they settle into their new home at Dragonstone. The camera pans in over the castle showing its enormity and focuses in on the dragons etched into the walls. There’s a sense of detail and depth here that adds gravitas to the character’s journey. When Daenerys says “Let’s begin” at the end of the episode, the words carry a heavy weight as they aren’t surrounded by other lines of dialogue. There’s a restraint there that’s missing from other shows and it’s a restraint that makes all of the action sequences feel more alive. The program is greatly aided by its incredible ensemble cast, who have filmed all over the world. Each location has a unique feel to it and even momentary glimpses at new environments offer a level of grand detail. Samwell Tardy (John Bradley), a supporting character, now resides at the Citadel and even though he’s only in a few moments of the show’s premiere, his new life is beautifully revealed in a well-staged montage. In the season’s second episode, we witness quiet moments of great beauty (like Arya reuniting with her long-lost direwolf) and exhilarating moments of great war (like the battle between the Greyjoys). The show exists with both realities co-existing nicely. It’s moments like these that highlight this show’s unique and unmistakable world. New characters come onto the stage and are fully appreciated by the show’s producers and by the actors who do remarkable work with limited screen time. Game of Thrones is set for a seven-episode run this year but like in previous seasons, the show will continue to craft an amazing tale that would be hard to replicate in this medium or in any other.